SAN FRANCISCO -- After the head of a national police organization blasted Colin Kaepernick for wearing socks with cartoon pigs in police hats, the San Francisco 49ers quarterback said he didn't want the apparel to distract from his protest of racial inequalities in America. 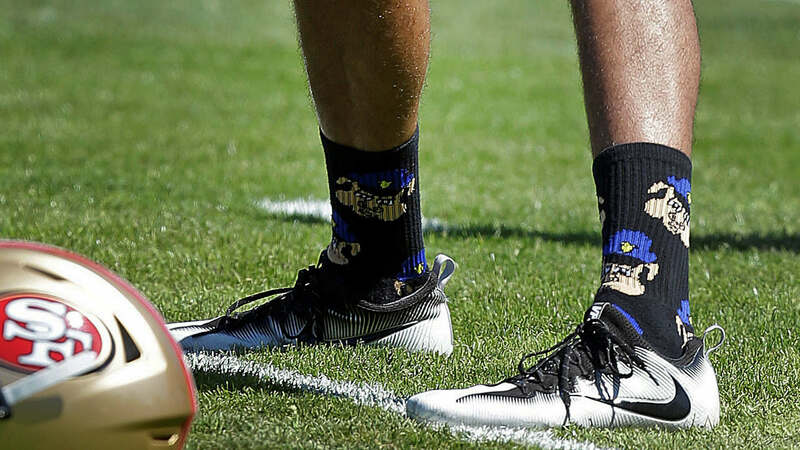 On Instagram, Kaepernick said that he did wear the socks in practice to make a statement but did so before he made a public stance by refusing to stand for the national anthem at preseason games. According to USA Today, Kaepernick has reportedly worn the socks as early as Aug. 10, but he had not been asked about them. Images of the socks were posted on social media Wednesday night and quickly created a stir. "It's just ridiculous that the same league that prohibits the Dallas (Cowboys) football club from honoring the slain officers in their community with their uniforms stands silent when Kaepernick is dishonoring police officers with what he's wearing on the field," Bill Johnson, executive director of the National Association of Police Organizations, said, according to USA TODAY Sports. "I think the league is in a downward spiral regarding their obligations to the public under (commissioner) Roger Goodell, and this is just another example of that." The league has taken action in the past for what players wear at practice. The NFL told the Patriots this summer that players must wear numbers on their practice uniforms, in part to monitor injured players. It's not clear if the league would come down on Kaepernick's statement socks. According to USA Today, the league said it would not comment until it spoke to the Niners. "I wore these socks, in the past, because the rogue cops that are allowed to hold positions in police departments, not only put the community in danger, but also the cops that have the right intentions in danger by creating an environment of tension and mistrust," Kaepernick wrote on Instagram Thursday. "I have two uncles and friends who are police officers and work to protect and serve ALL people. So before these socks, which were worn before I took my public stance, are used to distract from the real issues, I wanted to address this immediately." On Sunday, Kaepernick said the welcomed the attention that his stance has garnered. "The fact that it has blown up like this, I think it's a good thing. It brings awareness," he said. "Now, I think people are really talking about it. Having conversations about how to make change. What's really going on in this country. And we can move forward. ...There is police brutality. People of color have been targeted by police. So that's a large part of it, and they're government officials. They are put in place by the government. So that's something that this country has to change. There's things we can do to hold them more accountable. Make those standards higher." Kaepernick is expected to play Thursday night against the San Diego Chargers, who will be holding their annual salute to the military at the game. He has indicated that he will continue to sit for the national anthem until he sees change in the country. The socks are not the first apparel that Kaepernick has worn to make a statement. He also wore a Fidel Castro T-shirt and a Malcolm X hat last week. He has not been seen by the media wearing the socks since a San Francisco police officer's union official complained about his lack of sensitivity on Monday. Johnson, who represents more than 240,000 active law enforcement officers, called Kaepernick wearing the socks disrespectful, according to USA Today. "It doesn't seem like he's thought through or bothered to educate himself about the way (law enforcement officers) are out there trying to do a very difficult job, and the vast majority of the time get the job done right," Johnson said, according to the newspaper.